More and more hotels are seeing that beacons are here to stay. Beacons are a simple technology that uses Bluetooth low-energy systems to transmit special identifiers. When used with a mobile app, beacons provide a wealth of location-based data. They can signal a person’s precise location, monitor their movements, and prompt the delivery of a digital message. Beacons enable hotels to provide more personalized service and understand guest preferences without additional staff or support. They also increase guest acceptance of a hotel’s app. eConsultancy.com explained the many rewards that beacons offer hotels and guests. Today, beacons are common in retail, and now they’re quickly gaining acceptance from hotels around the world. While beacons in retail mainly focus on sending deals to shoppers, hotels should use this technology in a less promotional way. It’s better for hotels to first use beacons to make guests feel welcome, rather than sending them offers to buy and try. Of course, occasionally sending guests relevant offers based on their preferences and behaviors will certainly be appreciated, the primary purpose of beacons should be better service, not better sales. Beacons in hotels should be to used enhance the guest experience since they provide a wealth of guest data that allows for better service. With beacons, hotels can learn a guest’s preferences and provide more personalized service based on their needs. This makes guests feel welcome and valued, which leads to long-term loyalty. With the explosion of mobile usage, hotels are developing apps to help guests connect with their brands. Unfortunately, these apps do little but send guests special promotions or enable faster booking. As a result, most guests have few reasons to use a hotel’s app. But since beacons work together with apps, guests who enable a hotel’s app can have more personalized service and a better hotel experience. When a hotel deploys an app and beacons, it will know the moment each guest has arrived and recognize their personal traits, from appearance to language to preferences. This allows a hotel to greet guests on a personal basis and make them feel instantly welcome. Throughout a guest’s stay, a hotel can learn their interests and behaviors to anticipate their needs. By enabling a hotel’s app, a guest can receive the royal treatment and enjoy exceptional service, along with the occasional special deal that’s relevant to their needs. For most, these are reasons enough to activate a hotel’s app. Greet guests personally and seamlessly. Prepare a returning guest’s room to reflect their personal preferences. Stay aware of a guest’s movements in real time. Learn the amenities and facilities guests consume. Discover guests’ travel behaviors and preferences. Know how guests spend their time and money in a hotel’s bars and restaurants. Manage guest feedback and occasionally prompt for relevant reviews. Easy and expedited hotel check-in. Since the app detects guest arrival, the guest can bypass the front desk since the app delivers the digital room key directly to their mobile device. Room selection based on preferences from prior stays. Schedule hotel services and amenities directly from a mobile device. 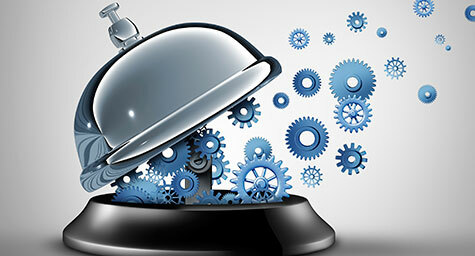 Obtain faster service at hotel restaurants and bars digitally, rather than wait for a server. Ability to increase loyalty points and redeem benefits during every stay. Quick access to perks from loyalty points. Link to proving immediate hotel feedback to ensure that issues are handled promptly and properly. The warmth and comfort of a truly personalized experience during every stay. Beacons are bringing hotels much closer to their guests to make their hotel experiences more personal and positive. As a result, more hotels are opening their doors to the benefits of beacons.